PORT MORESBY: Prime Minister Peter O’Neill and his government have overlooked priority areas of development in the country, Opposition Leader Don Polye told Parliament today (Friday). Mr Polye, who recently drove along the Okuk Highway, said during the Grievance Debate in Parliament that O’Neill and his ministers had lost their bearing on much-needed services across the country. He made a list of roads which needed immediate attention in the Highlands region and they include Kagamuga to Mt Hagen town (W.H.P), Togoba (W.H.P), Kopena (S.H.P), Jiwaka, Simbu, Eastern Highlands, and even Morobe and Madang highways. Polye was debating on Works Minister Francis Awesa’s parliamentary audio recording (hanset) in which he made a commitment last year that all these roads, including the four-lane road in Mt Hagen would be fixed starting January 17th, 2017. “I am not only talking to the minister but the Prime Minister must listen to this as well. “He overlooks the most priority areas. I am aggrieved by his conduct. It is a life line of PNG. Prime Minister and his ministers forget this piece of asset. What is more important to them? What is it that is much more important which preoccupies the minds of the Prime Minister and his minsters to continue forgetting about this important asset?” he said angrily. He said the people knew it very well that the country was undergoing a cash flow problem. “You (Prime Minister) cannot build these roads. There is nobody here who is stupid. The country has no money. Just say, Mr Prime Minister; we do not have money so we will shelve the upgrading of these roads. Sorry, we (government) have run the country down. We (government) do not have enough money to do these. The Opposition, you provide some alternative policies and you take over from us. 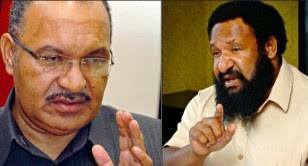 We will do it for you (Prime Minister),” said Polye.